Got a few weeks to kill while I await the various bits to start trickling in for the Geno Five-Two, so I thought I'd pull out the Inq28 models and work on them for a while. Any self-respecting warband needs at least one meatshield, which brings us to Horgg VanDerHuge, Ogryn bodyguard! 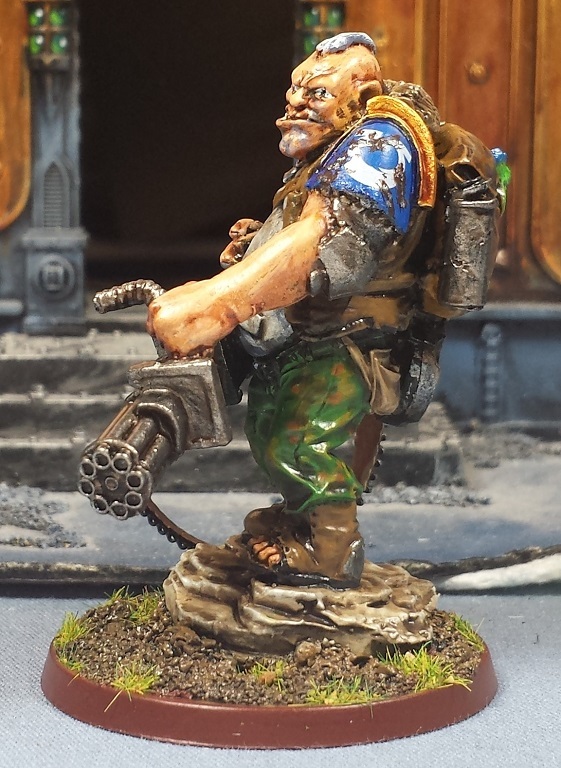 I wanted to ensure he was very slovenly as Ogryns are wont to be, so after laying on the basic colors I went over the model with a number of different grey, brown and rusty washes to give him a scruffy appearance. I tried to do a little grey stippling around the jaw and chin to try and approximate a 5 o'clock shadow, but it's not particularly convincing in the pics. Pretty sure I need to hit that area again. I don't recall what range this model is from, I'd picked it up a few years back at GenCon, I want to say at the Mike McVey booth? 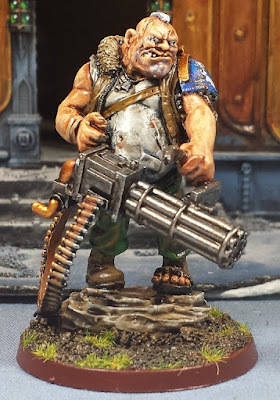 A big ol' Ogryn ought to have a big ol' gun, and it's hard to go wrong with a minigun right? Still working on the fluff for the models, and I'm finding their stories are growing out of the paint scheme. Somewhere along the way Horgg worked alongside (or perhaps fought against) the Ultramarines, and he proudly wears one of their shoulder plates. He also has a pet grot, which has spun off an idea of doing a couple different warbands - The puritanical Ordo Hereticus Inquisitor Helios (pictures to come), and an opposing radical Ordo Xenos inquisitor whose warband includes a number of Xenos/Abhuman mercenaries (many of which to be unveiled soon). Definitely challenging to just paint one model at a time, but to be honest I'm quite enjoying it! What's that story behind the smurf shoulder guard? Gift of honor or battlefield spoil? Really nice - this model has bags of character. The Ultramarine shoulder guard is a great touch. It helps emphasize how big he is too. Love his skin as well! Great job! I flippin LOVE this model. Such a cool sculpt and you painted him beautifully mate. 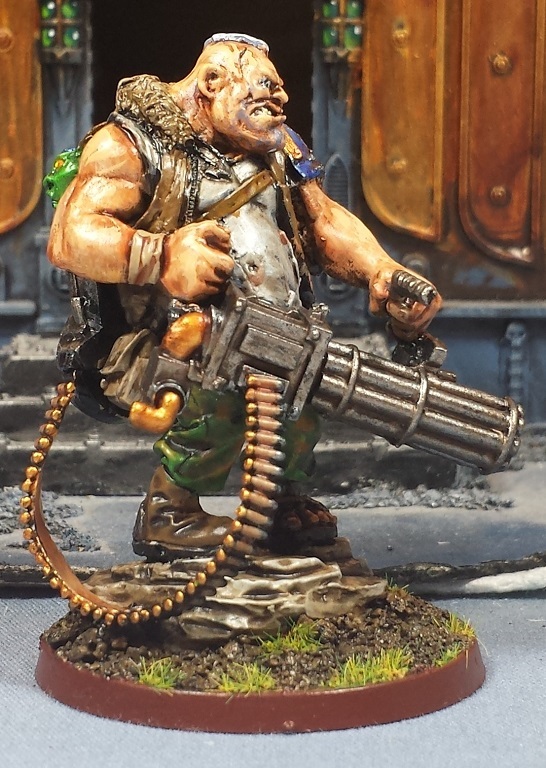 Your Ogryn and mine would make good combat partners. From where the model is? I like how you do the skin for models, it looks perfect. I love the weathering; just the right amount of grunginess for a big smelly ogryn. The Ultramarine pad is a nice touch as well. 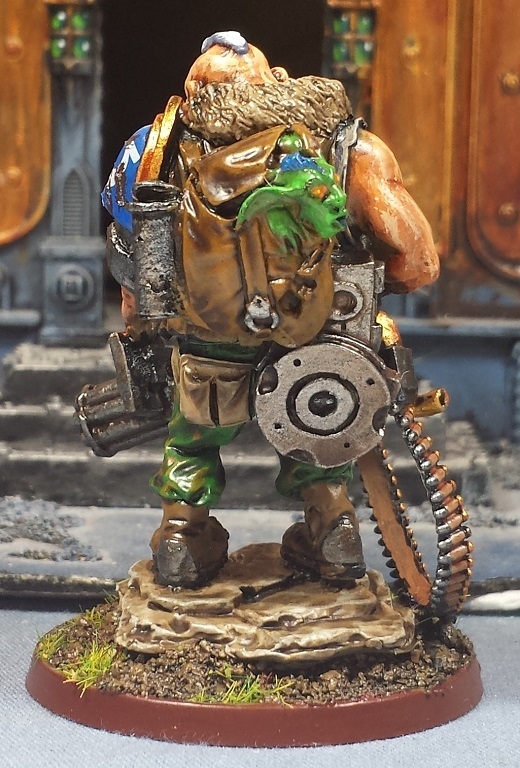 Is the gretchin in his backpack a snack or a pal? 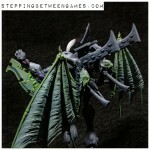 He looks great Mordian! I love the little details you put into store like the ultramarine shoulder and grot. @Da Masta Cheef: Hah! I love it! @Greg Hess: Cheers man! Tried a few more layers and washes than I usually do, quite pleased with how it worked. Not sure I'd go to that extent in a big project, but totally fun to do on the single models like this! @Rory Priest: Everyone in the warband he's a part of will definitely need earplugs! Hah! @Dai: Nice! I really dig that one, man! @Jakub Furlanetto: Unfortunately I don't remember what company made the model - I'd picked it up at GenCon a few years ago, that's about all I know. Sorry! @#2501: Thanks man! Why can't it be both? Haha! Love this guy, so characterful! Great job!